As general manager of Star Prairie Trout Farm, he said he must submit meticulously detailed paperwork to the Department of Natural Resources in order to keep Wisconsin’s oldest continually operating fish farm in compliance. Otherwise, penalties from the state can put businesses “in serious trouble,” he said. That’s why he lauded a bill signed Friday, June 23, by Gov. 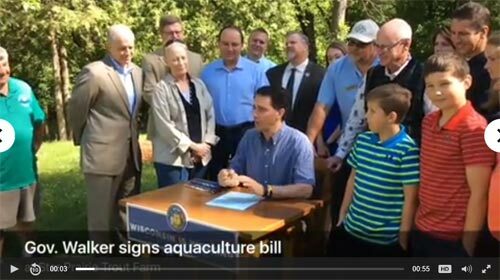 Scott Walker at Star Prairie Trout Farm.